Gorham is a high quality American pear, but with an all European-ancestry. Its juicy melting flesh is very typical of the best European pears of the 19th century, and it is related to both the English Williams pear and Belgian Josephine de Malines. Gorham can perhaps best be considered an improved Williams pear. From Josephine de Malines it gets better keeping qualities and an improved flavour (even though Williams is already well-regarded for flavour). Like Williams, Gorham is versatile - as well as being a superb dessert pear, it is also useful for cooking and bottling. Please fill in the details below and we will let you know when Gorham pear trees are back in stock. Gorham is in flowering group 4. Gorham is self-fertile and does not need a pollination partner, although fruiting may be improved if there is a compatible tree of a different variety nearby. 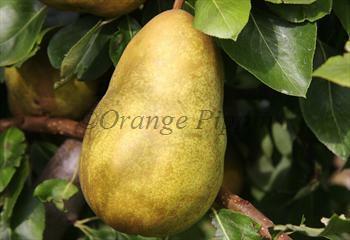 Being an American pear with a European pedigree, it is perhaps no surprise that Gorham does best in dry sunny climates. It should perform well in the south-east of the UK, but elsewhere be sure to choose a sunny spot, preferably in front of a south-facing wall. Gorham also has a very good level of disease-resistance, and its excellent pedigree ensures it is a good and reliable cropper. The fruit size is relatively large by pear standards - provided you thin the fruitlets in late spring. Gorham was raised in1910 at the famous New York State Agriculture Experiment Station at Geneva, New York - now part of Cornell University. Gorham is a cross between Josephine de Malines and Williams, two classic old world pears. Williams, also known as Bartlett in the USA, had proved very well-suited to the North American climate and by the late 19th century was a well-established commercial variety. Williams was therefore a natural starting point for American growers, but despite being an improvement over Bartlett by virtue of its later-ripening and better keeping qualities as well as a superior flavour, it has not achieved the commercial success of its ancestor.